The Commonwealth of Australia is a sizeable country located within the world's Southern Hemisphere and includes the island of Tasmania. Originally inhabited only by the Aborigines, Australia now has numerous nationalities living here, including many of British and European origin. Situated in the South Pacific, the Dutch, Spanish and the Portuguese first explored Australia in the early 17th century. The British began colonising Australia in the late 18th century and the transportation of convicts started around this time and continued until 1868. 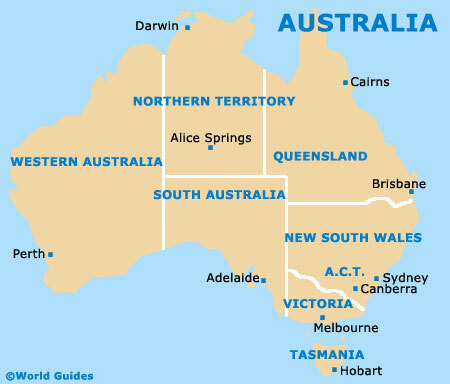 Australia is now divided into eight states and territories - New South Wales (NSW), Australian Capital Territory (ACT), Queensland (QLD),Victoria (VIC), Tasmania (TAS), South Australia (SA), Northern Territory (NT), and Western Australia (WA). There is a wealth of accommodation in Australia to suit all travellers including budget lodging, travel lodges, bed and breakfast and luxury hotels. Australia has numerous world-famous tourist attractions, such as the Great Barrier Reef, Sydney Harbour Bridge, Sydney Opera House, Ayres Rock, Bondi Beach and the Surfers Paradise coastline. There are many interesting cities to visit in Australia. The capital city of South Australia (SA) is Adelaide, situated between the Gulf of St. Vincent and the Adelaide Hills and featuring stunning beaches; Brisbane, on the south-east of Queensland, Australia, a popular tourist destination; Canberra, the capital of Australia, situated between Sydney and Melbourne and featuring an array of tourist attractions; situated on the large island of Tasmania, Hobart is one of the most scenic areas in Australia; the city of Melbourne is one of the most popular tourist destinations; Perth, the capital city of Western Australia (WA), offers a wealth of spectacular tourist attractions; the exciting city of Sydney has numerous places of interest and also features some of the most beautiful beaches in the world. This enormous island is well supported by airports, with the biggest residing at Sydney, Melbourne, Brisbane, Perth, Adelaide and on the Gold Coast. Flights to Australia have never been more popular or affordable, and each year, the principal airports support more than 100 million passengers, both domestic and international. Adelaide, the capital city of South Australia (SA), was founded in 1836 by free settlers and is located on a coastal plain between the Gulf of St. Vincent and the Adelaide Hills, with much of Adelaide being divided by the Torrens River. Alice Springs, in the Northern Territory (NT) of Australia, is known locally as just 'Alice' and is the largest settlement in central Australia. Surrounded by scenic areas, Alice Springs was established as an Overland Telegraph Station. Brisbane is situated on the south-east of Queensland, Australia, and Brisbane is one of Australia's most popular holiday destinations. This stylish city has evolved around the River Brisbane, which meanders through central Brisbane. With enticing beaches and lively nightlife options, along with an established tourism scene, Byron Bay is also known for its seasonal whale watching, favourable surfing conditions and Cape Byron Lighthouse. Situated in Far North Queensland, the city of Cairns has never been more popular. Visitors come for the giant man-made lagoon, as well as access to the neighbouring Great Barrier Reef and Daintree Rainforest. Canberra is the capital of Australia and Canberra is the most prominent city in the Australian Capital Territory (ACT), home to Australia's Parliament. Built in the early 20th century, Canberra is situated between Sydney and Melbourne. Darwin, in the Northern Territory (NT) of Australia, is the only main city in the 'Top End' of Australia. Surrounded by scenic areas of outback Australia, Darwin was established in 1869 and contains much Aboriginal heritage. Hobart, on the large island of Tasmania, is the southern most capital city in Australia. Straddling the Derwent River, Australia's deepest harbour, Hobart is one of most beautiful areas in both Tasmania and Australian. Centred around the Yarra River, Melbourne's oldest and probably most important landmark, Melbourne has recently been reinvented, making Melbourne one of the most trendy cities in Australia, with a mix of architecture. Residing on Queensland's aptly named Sunshine Coast, Noosa is made up of a series of connecting communities, all of which have grown up around the Noosa River. These include Noosa Heads, Noosaville and Tewantin. Perth is a spreading and diverse city and Perth is the capital city of Western Australia (WA), which is the largest state in Australia. Perth's smaller size and rich history make this diverse city especially appealing. A real highlight lying within Australia's Tropical North, Port Douglas offers a rich gold rush heritage, being famed for its lengthy Four Mile Beach. Scuba diving trips to the nearby Great Barrier Reef come recommended. Sydney is one of the oldest cities in Australia, and Sydney is also one of Australia's most exciting cities. The city of Sydney is home to the spectacular Syndey Harbour, an extremely mild climate and stretches of heavenly beaches.